Welcome to Tr3 Trends, NCTQ's monthly newsletter designed just for school district officials. Each month we use data from NCTQ's Tr3 database to highlight the latest trends in school district policies and collective bargaining agreements nationwide. Tr3 contains teacher policies from 114 school districts, including the 50 largest districts, the largest district in each state, Broad Prize winners, Gates investment districts and members of the Council of the Great City Schools. Teacher policies from all 50 states are also included. Only about half of the districts for which we have data (45 of 94) require that substitutes have a bachelor's degree. Nineteen districts (20%) require an associate's degree; 18 districts (19%) require some college; and 12 districts (13%) require a high school diploma or GED. States often decide for their districts what the qualifications of a substitute must be. In a little over half of all states, substitutes are required to earn a license or certificate. The "No" category includes: Alaska, Arkansas, Georgia, Idaho, Louisiana, Maryland, Massachusetts, Mississippi, Montana, New Hampshire, New York, North Carolina, Oklahoma, South Carolina, South Dakota, Tennessee, Texas, Utah, and Virginia. The "Determined at district level" category includes: Connecticut, Delaware, Florida, Indiana, and Vermont. 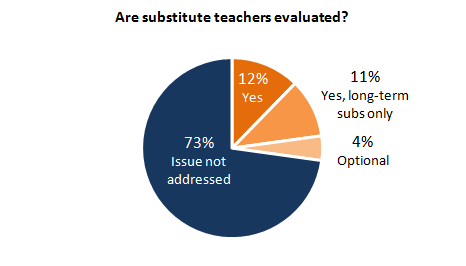 New Haven; Minneapolis; Dekalb County, Georgia; Brownsville, Texas; Seattle; and Fresno are some of the 14 districts that evaluate all of their substitutes. An almost equally large group of districts (12 of 114), including Nashville, Boston, Los Angeles, and Oakland, evaluate only long-term subs. 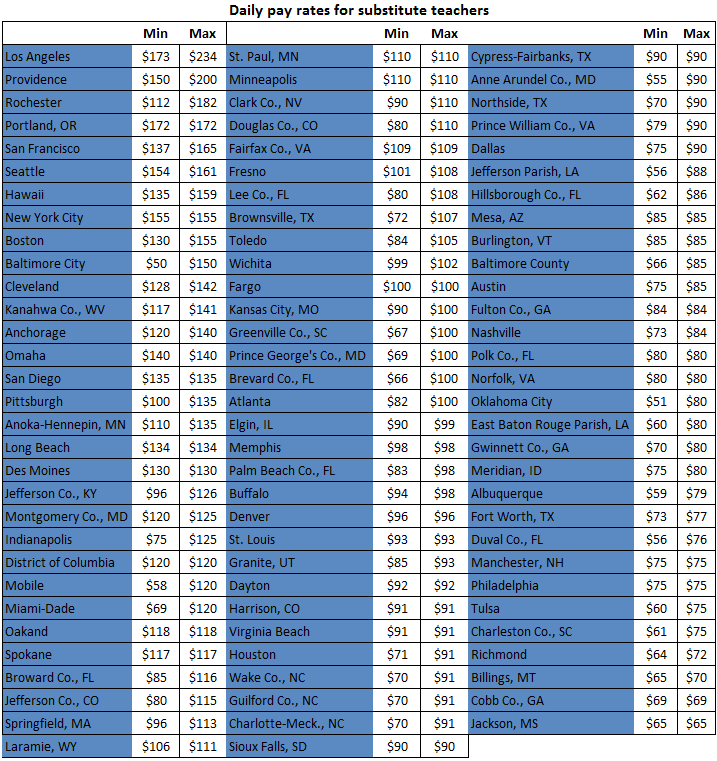 Chicago, San Francisco, Houston, Detroit, and Philadelphia are among the 24 districts we know of that give health benefits to long-term subs, full-time subs, or subs who work a minimum number of days per year. In Denver, long-term subs can participate in all district benefits programs "at their own expense," according to the teachers' contract. Duval County, Florida and Cincinnati are the two districts that say they give substitutes health benefits but don't specify which subs receive the benefits. Cincinnati's teacher contract says "district substitutes are eligible for the same health benefits and Term Life Insurance as other full-time teachers, by making the same contribution," while a Duval website says that "health benefits" and a "401k plan" are some of the benefits offered to substitute teachers. Go toTr3's custom report page to access all the data we use in Tr3 Trends and to compare teacher policies in 114 school districts nationwide. Send feedback to gmoored@nctq.org.